The Broadway extension, which will extend the street car from Denny to either Roy or Prospect, is still in the planning stages. 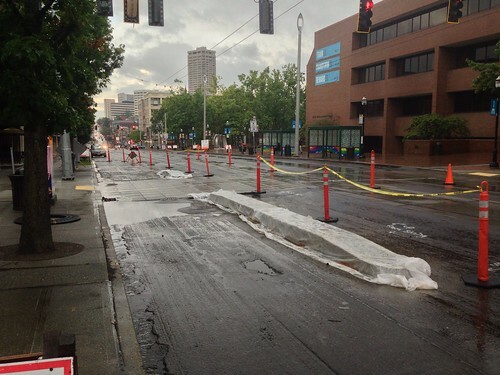 Seattle Department of Transportation is currently responding to a mandatory federal review of the extension. SDOT’s Ethan Melone told CHS the city plans to make a decision on the Broadway terminus by spring 2014 — just as the streetcar line is hoped to be close to starting service. According to an SDOT survey earlier this year — dominated by some 600 online respondents — E Prospect was the preferred terminus for 64% of people who participated. 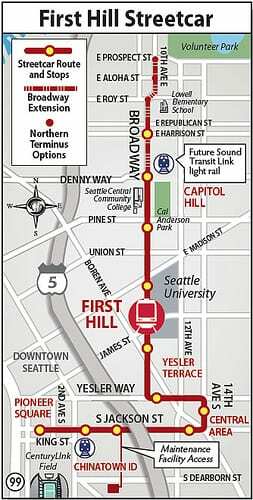 The extension along Broadway’s main retail corridor is scheduled to be completed by 2016, right when the first light rail trains should be rolling up the Hill. 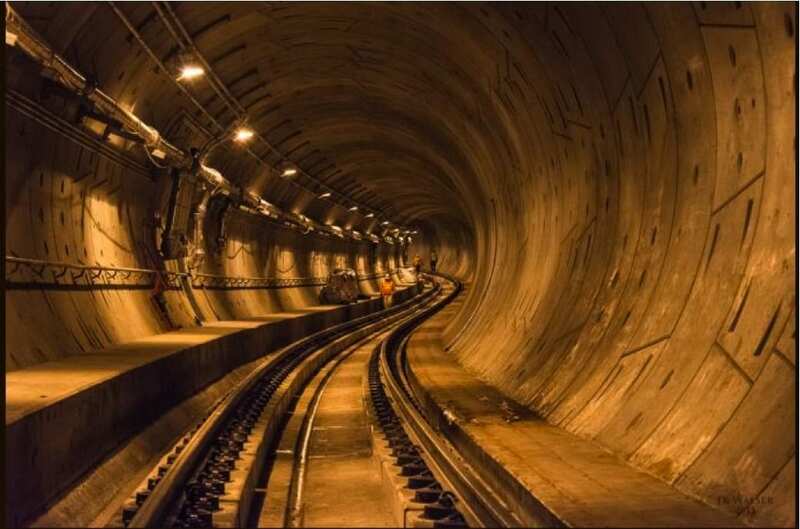 Light Rail University-Link and Capitol Hill Station: Moving below ground, Bruce Gray at Sound Transit tells CHS that the light rail University Link continues to chug along ahead six months ahead of schedule and $100 million below budget. Construction recently finished on one continuous track connecting downtown and Capitol Hill, with power lines to be completed soon. Work on the underground station is also coming along. Gray told CHS that 25% of the Capitol Hill station is now complete. Gray said major concrete pouring of the station walls and floors will continue into the coming weeks. The University Station is now 75% finished. The multi-year process to draft a plan for the five properties around the station have basically wrapped-up after the Seattle City Council approved the blue prints for the project last month. The Sound Transit Board is expected to approve the agreement (PDF) during its upcoming Sept. 26 meeting.The community group Capitol Hill Champion and others who helped hammer out the agreement are now taking a breather as they await the contractor selection process. As soon as the board approves the agreement, Sound Transit will begin soliciting contractors to work on the sites. The bulk of the development isn’t expected to be complete until after the first light rail trains roll through in 2016. Capitol Hill Chamber of Commerce director and Champion member Michael Wells said the the Champion group will have a seat at the table when contractors begin vying for the work, but will have no formal vote on awarding the contract. The five sites are poised to be a neighborhood defining development in the coming years for retail and housing. Of the more than 400 apartment units possible across the five sites, the agreement sets groundwork for nearly 40% to achieve the city’s affordable housing mark — 50% of the area’s median income, or around $30,000 per year for a one-person household. Broadway Cycle Track Infrastructure Construction across from Seattle Central Community College, originally uploaded by Gordon Werner. This entry was posted in News, etc. and tagged light rail, streetcar, transit by Bryan Cohen. Bookmark the permalink. I’m curious to find out how to get involved on the public discussion of the street car extension being proposed. I’m actually opposed to it going to Prospect as I live near there and I’m concerned about the noise (signaling leaving and arrival) and the congestion it will create at that intersection. I’m not sure how this statement can be accurate: “The extension along Broadway’s main retail corridor is scheduled to be completed by 2016, right when the first light rail trains should be rolling up the Hill.” since the final terminus has not been selected, nor has funding been lined up or an official decision made, from what I have read. I think what is meant is that if it goes forward, it would be completed in 2016. PNWCWBYMAN: I am also opposed to the extension beyond Roy. Getting involved in the process has been far more difficult that I would have expected, to my knowledge there was just one big community meeting amidst last december’s holiday season (and held over a mile away from people directly affected by the extension at the silver cloud between 4 and 6pm) and an online survey with minimal outreach. I’ve talked with Malone, written to Bruce Harrell, Tom Rasmussen, Mike McGinn, met with one of McGinn’s staffers, tried to keep up to date via the seattle street car website and facebook. If the street car is extended past Roy, the 700 and 800 blocks of 10th ave e will be the only two purely residential blocks in the city with a street car rolling down them. The cost seems higher than the value since the area is already served by the 49 bus (in both directions) and there is no MAJOR attraction at Prospect, just an up-hill walk to Volunteer Park, and an additional 2 blocks to St. Marks. The walk to Roy from prospect is trivial, and if Route 49 bus remains as-is, I’d imagine most people from points north would take the 49 bus to the transit center (or their final destination down Pine). The logical last stop on the street car is actually the 600 block of broadway (between mercer and roy) where riders could make an easy transfer to the north bound 49 bus, and the tracks and “stop” wouldn’t interfere with the lovely 5 way intersection of roy, roy 10th, 10th and broadway (and the 76 gas station). Not being from Seattle, I can’t claim to know all the ins and outs, but I wonder if you (a general statement) tend to think that streetcars are placed only in commercial areas, because that’s what you see in South Lake Union. Plus streetcars tend to run on arterials and arterials are often commercial. The original routing of the Portland Streetcar goes through the Nob Hill neighborhood, and one of the streets I seem to recall is pretty much residential only (mix of single family and apartments). I imagine most of the people in Nob Hill love having the access to the streetcar, regardless of the type of block it runs on. Of course, historically, streetcars ran on both commercial and residential streets. Thank you, Gregory….I agree with you. It is not too much to ask those living north of E Roy to walk a block or two after they disembark the streetcar…it’s totally flat. For those who have mobility issues, the 49 bus might get them closer to where they live. Extending to Prospect would cost a lot more money. “Better access” to Volunteer Park is an argument some make for extending the streetcar to E Prospect. This is specious because a bus serves the eastern side of the park, and that stop is actually much closer to the park features most people (including tourists) want to visit…SAAM, the Conservatory, children play area. I don’t see why you guys are writing off north Capitol Hill like this — it’s not about just serving people living on Prospect, it’s reaching St. Marks, or the neighborhood around Bertschi, or why not extend this eventually along the 49 route down Harvard? There are a couple projects along 10th now where parking lots or low-density/single family housing is being converted to denser units, which is a good thing — more people within waling distance of B’way and Pike/Pine and able to commute to many job centers without driving. There’s tons of data that streetcars help with this kind of development — better housing investments, smarter density, etc. I totally get that in theory Volunteer Park is well served by bus lines, and it is, but streetcar investments are different — tourists actually use them, and so do many people who tend to avoid buses. Rational or not, that’s reality, and other cities that have invested in streetcars have generally gotten a pretty good return. I’m not against streetcars….I think they’re great, if built in areas that actually need transit service. I am against duplication of such service. The 49 bus serves north Capitol Hill very well. And I would point out that the two new developments on 10th (one almost complete, another pending) are going ahead regardless of streetcars in that area, so it’s not true that we need streetcars in order to encourage density. I disagree that we should be installing expensive streetcar lines where bus service is already adequate, just because some people don’t want to use a bus. The land around Beacon Hill Station is not and never was owned by Sound Transit, most of it is owned by someone who is not interested in developing the land. The Capitol Hill Station site is a completely different situation as Sound Transit and the city will be overseeing the development of the station area once construction of the station is done. Plus the state of the real estate market in Capitol Hill is much much stronger, and the area around where the station is going to be is already a much more intense activity center compared to Beacon Hill. Hopefully, the CURRENT Mayor and Council will not Sell Away the affordable houseing like they DID in South Lake Union. It is all the developers want is higher rental housing and high end condos. You might want to check how high the retail rental rates are in the area.It will be an interesting next few years. With as much work as has been completed on the University-link I’m surprised it still won’t open until 2016. It sounds like it’s going to be sitting empty and unused for months or maybe they’re intending to sandbag the end of the project. The Cap-Hill station should be able to open even if no progress has been made on the housing portion by then. One track and no power? It sounds like there’s a lot of work to go.